Our individually styled bedrooms and suites are designed for a restful stay. 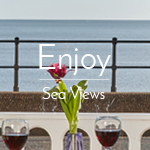 Many enjoy sea views with some having a balcony overlooking the Esplanade and Lyme Bay. 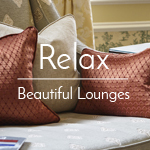 We want you to feel comfortable and relaxed during your stay with us, which is why we don’t have just one, but three beautifully furnished lounges in which to sit and enjoy. Combining traditional silver service with classic and modern cuisine, our freshly prepared dishes and carefully selected wine, provide an excellent dining experience. The Royal York and Faulkner Hotel is a magnificent Regency Hotel with an unrivalled position on Sidmouth’s elegant Esplanade. Guests can enjoy glorious sea-views from balconies offering uninterrupted views of Sidmouth beach, Lyme Bay and the red rock Jurassic cliffs of East Devon’s coastline. 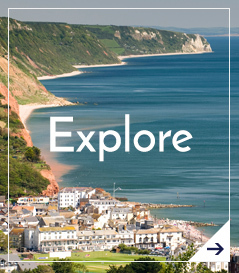 Just a stone’s throw from the beach and the picturesque town centre, our seafront hotel is the perfect choice for a relaxing break in the unspoilt seaside resort of Sidmouth. During your stay you may choose to visit the unique little shops in the town or take a stroll along the Esplanade. If you are feeling energetic, take a walk to the top of Salcombe or Peak Hills to get a fantastic view of the bay and the town. Or, you could just hire a deckchair and watch the world go by. The hotel has been run by the Hook family for three generations. 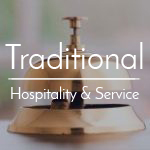 It is renowned for its traditional hospitality, friendly service and attention to detail. 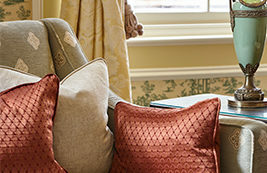 Guests have the choice of three comfortable and beautifully furnished ground floor lounges. There is also the stunning sea view lounge bar where guests can take in wonderful sea views whilst relaxing with a drink or light lunch. 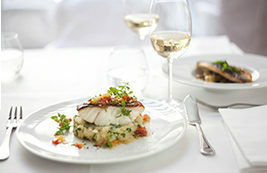 Our silver service restaurant offers a varied menu of classic and modern cuisine. Meals are freshly prepared from locally sourced food. The four-course table d’hote dinner menu gives a choice at all courses. Many of our comfortable well-appointed guest bedrooms enjoy sea-views. The very sought after deluxe rooms lead to the balcony. 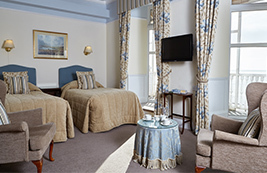 Here guests can relax and enjoy splendid views of the Esplanade and Lyme Bay. Our individually furnished bedrooms differ in style, size and décor. Some are more traditional, befitting this fine Regency building, whilst others have a more modern and contemporary style. There are also two private suites, which offer added space and privacy. Both have balconies with the same splendid sea views of the famous South West coastline. Take a look here.